Made of heavy stainless steel and virgin Unbreakable ABS Food Grade Materials. Durable-lasts as long as it should. Time saving and perfect handle grip. Dust proof coating prevents the surface from chipping or peeling. ♦ THE PERFECT GIFT WITH A MULTITUDE OF USES - Measures 2.26-inch in diameter and 8.66-inch in height. Not need to add the dough frequently. 12 sturdy plastic discs in fun shapes including holiday shapes such as a wreath, pumpkin, Christmas tree, flowers, and a heart. 6 decorating tips to make unique shapes and designs for easy icing. Perfect for Spritz cookies and cupcakes. ♦ FOOD GRADE MATERIAL - Made of high quality food-grade silicone, ABS resin ( The FDA standard ).Tasteless, non-toxic, dustproof, durable, impermeable and easy to clean. Hand wash and wipe dry. ♦ ERGONOMIC DESIGN - Ergonomic handle is easy on your hands. Non-slip base keeps it steady while squeezing dough. Always create cookies consistently. You can replace the mold or add paste by rotating the bottom of the cookie maker. Closely and firmly packaging will protect bend until it's intact to reach your hands. Perfect for being a gift of Christmas or other holiday and occasion. 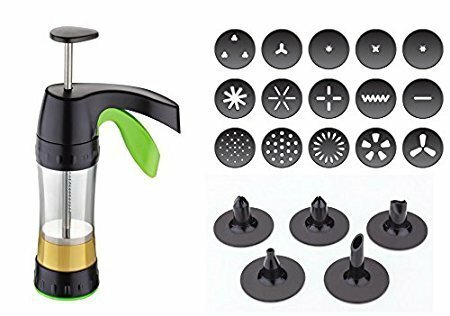 ♦ EASY TO USE - Solid and smooth plastic will not paste the dough and this is removable so that it is very easy to clean. The cylinder is made of thick frosted glass that is clean and solid. Ultra-clear barrel shows how much dough you have, easy to operate. ♦100% LIFETIME GUARANTEE: Our food grade premium cookie press is crafted with the best materials. If you are not 100% satisfied with this attractive cookie gun ,we promise to give you a full refund or replace your product in no time - no questions asked. View More In Cookie Presses. If you have any questions about this product by DarkPyro, contact us by completing and submitting the form below. If you are looking for a specif part number, please include it with your message.